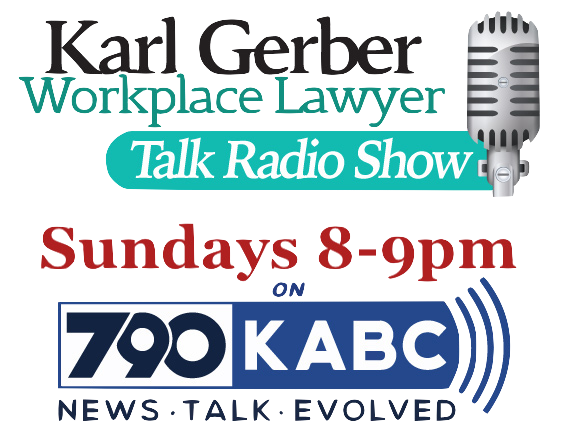 Since 1993 firm owner Karl Gerber has handled more than 1,650 separate California employment cases with a high rate of success of all binding arbitration and jury trials he has first chaired. All employment cases for employees are taken on a contingency. We are only paid a fee when and if we win. We advance all costs. We handle Wrongful termination, Discrimination (age, disability, national origin, race, pregnancy), Sexual Harassment, Medical Leave Discrimination (FMLA, cancer leave), Unpaid Wages (unpaid commissions, prevailing wages, overtime), and missed meal break cases. If you are having a work problem with your employer on any employment issue, contact us to discuss your case and your options. We handle cases in California. We have offices in Sherman Oaks, Los Angeles, Gardena, Oxnard (Ventura County,) Bakersfield, Tustin (Orange County,) San Bernardino, Riverside, San Diego, Sacramento, San Jose, and San Francisco. Can I sue if I am still employed? Who is a free consultation Labor Lawyer? Paid cash, can I sue?